The Presiding Bishop of the Anglican Church of Ceylon, Dhiloraj Canagasabey, has defiantly expressed his faith in God as terrorists attacked Churches in Sri Lanka. On Sunday afternoon, London time, the death-toll stood at 207, with hundreds more injured. “If God gives me permission to live, I shall live. If he gives me permission to die, I shall die,” he told the Archbishop of Canterbury in a telephone call this morning. Bishop Dhiloraj was just beginning the Prayer of Consecration during an Easter Eucharist service at the Cathedral of Christ the Living Saviour at Cinnamon Gardens, Colombo, when the police arrived and warned him to leave. “You must come with us, they are about to come and kill you.” But the bishop refused to move until he had finished the Prayer of Consecration. We are terribly shocked and deeply saddened by the barbarous acts of violence brought on innocent worshippers, children, women and men at Easter Sunday services at St. Anthony’s Church, Kochchikade, St. Sebastien’s Church, Negombo and Zion Church, Batticaloa., as well as on several hotels in Colombo targeting visitors to our country. The Church of Ceylon unreservedly condemns these cowardly and cruel acts of terrorism and we offer our deep condolences to the families and friends of the over one hundred persons who have lost their lives and those who have been hurt. We wish all those who have been injured full recovery. We pray for them and their families that God’s comforting presence will continue to be with them through this tragic experience. We call on the government to institute quick action to investigate thoroughly these incidents and to bring the perpetrators to justice., to ensure the safety of places of religious worship and to prevent any individuals or group taking the law into their hands or provoking acts of intimidation or violence against any community or group. We call on all Sri Lankans to be mindful at this time and to act with patience and understanding. We ask for the continued support of all security and emergency services in ensuring public peace and in providing care for the affected the motives of those twisted and warped minds who planned and executed such appalling acts could very well be to destabilize the country and to cause damage to the unity and harmony of our nation. We pray that these persons, whoever they may be, will be awakened to the awfulness of their crime. We pray we will be able to journey through this dark phase of our country. May the Peace of the Risen Christ who on the cross prayed for forgiveness be with you all. Giles Fraser UnHerd What does salvation look like? 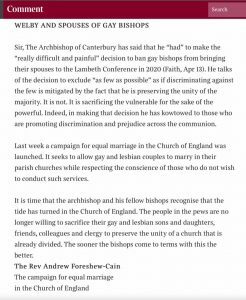 Stephen Spencer Anglican Communion News Service Why all the fuss about Discipleship?